As usual, Mixed Blood Theatre is doing something pretty remarkable right now. They're presenting three plays in rep, all written by young black men. Under the umbrella "Prescient Harbingers" (meaning: "having or showing knowledge of events before they take place;" "a person or thing that announces or signals the approach of another"), these three brilliant plays explore what it means to be a black man in America, directly or indirectly (one is even subtitled Being Black for Dummies), along with commenting on race relations in America and more generally on modern life in America. Young black men are dying at an alarming rate, and these are voices we need to listen to if we ever hope to understand the problem so that we can stop it from happening. If you are a young black man, I can only imagine how validating it must feel to see these voices and these stories on stage. If you're not, I encourage you to go see one, two, or preferably all three of these plays with an open mind and an open heart. Listen, hear, laugh, cry, be disturbed, get angry, join the movement for justice and equality. 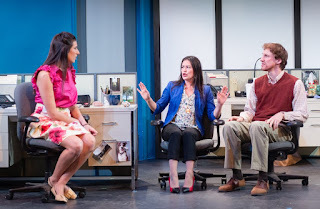 But don't go see these plays just because it's good for you, good for the larger community, but also because they're extremely well-written and beautifully produced by the team at Mixed Blood Theatre, and make for one entertaining and engaging day of theater. All three plays are presented on Saturdays and Sundays through December 2 with about an hour in between, during which you can get sustenance from the lovely sandwiches, salads, and snacks provided by Birchwood (also available for pre-order here), with single plays showing Wednesday through Friday evenings. You can see all three plays for just $35 (click here for information and to make reservations), or, as always, you can take advantage of Mixed Blood's "Radical Hospitality" program - free admission for available seats two hours prior to the performance. Please carve some time out of your schedule to see this important work. Here are a few thoughts on these three very different but thematically similar plays, in the order that I saw them (note that the first two are 90 minutes no intermission, the last is two hours including intermission). You may be familiar with Playwrights' Center core writer Idris Goodwin's work from the also brilliant play Bars and Measures, produced by the Jungle Theater two years ago as part of a rolling world premiere. Unlike the other two plays in the trilogy, this play was basically imported from Company One Theatre in Boston, and does not share cast or creative team with the other two. I'm not sure how that happened, but I'm grateful to Mixed Blood for bringing us this play and this cast because it was a fantastic start to the day. Hype Man tells the story of three musicians. Rapper Pinnacle (Michael Knowlton), a white man, and his hype man Verb (Kadahj Bennett), a black man, grew up together, and have worked hard to build their career and their name, to the point where they're soon appearing on The Tonight Show. A few years ago they added Peep One (Rachel Cognata) to the group, a female beat maker of unknown race (literally, she was adopted and recently did a DNA test, but hasn't looked at the results because not knowing allows her feel empathy for all races). On the day that they're rehearsing for their big TV appearance, an unarmed black teenager is shot by police in their unnamed city, affecting the group in different ways. Verb wants to use their TV appearance to make a statement, Pinnacle doesn't want to be too political in their first big national appearance, and Peep eventually breaks the tie, as they decide to wait. But Verb is tired of waiting, and reveals a "Justice for Jerrod" t-shirt at the end of the performance, causing a rift in the friendship that is painful for all involved (including the audience). In the course of the group breaking up and trying to find their way back together, issues of white privilege, the very real danger to young black men in this country, and the treatment of women in rap are all discussed in a very real, very accessible way. These are tough conversations, and we in the audience benefit from hearing them. And this amazing Boston cast (directed by Shawn Lacount) give such raw, believable performances, particularly Kadahj, with tears running down his cheeks during one of Verb's more affecting monologues. It's a really beautiful and powerful piece, and a testament to the power of theater to give voice to the voiceless and engender empathy. And although the only rap I know is by Lin-Manuel Miranda, the rapping/beat parts of this "break beat play" are awesome and add much to the storytelling (with music direction by Kadahj Bennett). What's interesting about this trilogy is that each play has a distinctly different tone. While Hype Man is a pretty serious drama, Hooded has a highly comedic, stylized, and almost campy tone, through which some pretty serious issues are explored. Our main character, Marquis (William Thomas Hodgson), is a young black teenager who was adopted by white parents (hence the theme songs from TV shows like Webster and Different Strokes used before and during the show) and attends a wealthy, mostly white prep school. But he's still black, so when he and two of his white friends are found trespassing, he's the one that's arrested. While waiting for his lawyer mother (Bonni Allen) to get him released, he meets Tru (Nathan Barlow), from Baltimore's inner city. Marquis' mother decides to take Tru in and sponsor him, and Tru decides to teach Marquis how to be black, writing a manual called "Being Black for Dummies." Through meeting Tru, interactions with his school chums Hunter and Fielder (Tom Reed and MacGegor Arney), a date with potential girlfriend Clementine (Kathryn Fumie), and Tru's manual falling into the wrong hands, Marquis is in for a rude awakening about the world we live in. Under the direction of Thomas W. Jones II, this wonderful cast (which also includes Bruce A. Young as a cop, and Colleen Lefeber and Kendall Kent as the hilariously named students Prairie and Meadow) leans fully into the stylized tone of the show, including some ridiculous dance moves and poses. They somehow manage to give funny performances, without making light of the deadly serious issues at stake, namely the very real danger facing young black men, no matter where they grew up or who their parents are. Sticking with the TV theme, there's a light-up "laugh" sign, and before the show the very stern cop tells us that we'll be instructed when to laugh; laughing at other times means we're racist (and he'll shine his flashlight on you!). Observing when the "laugh" sign lights up and when it doesn't, vs. when the audience actually laughs, adds a whole new level to the play that would require a couple more viewings to unpack. Mixed Blood produced Jacobs-Jenkins' play Octoroon three years ago, my first introduction to his work. While Gloria deals less directly with racism than that play, or the other two in this trilogy, it holds a mirror up to several other uncomfortable facets of society. Namely the culture of violence we live in, our obsession with celebrity deaths and tragedy, our disconnection with the people we spend our days with, and the pressures of success. I saw this play at the Goodman Theatre in Chicago last year, and am thrilled that it's now receiving its Minnesota premiere. It's a brilliant play - funny, shocking, thought-provoking, disturbing. And it also includes a pretty big spoiler I'm not going to give away here, but which makes it a little difficult to talk about. Suffice it to say that what begins as a very funny and real workplace comedy set in a magazine office in NYC turns into something much deeper and darker. There's significant overlap between this cast and Hooded, including five of the same actors (Bonni Allen, Colleen Lefeber, Kathryn Fumie, Tom Reed, and William Thomas Hodgson), plus an additional actor, Ernest Briggs. Some of them play multiple characters in Gloria, so not only are they juggling two plays, but multiple characters within those plays. Under the direction of Lavina Jadhwani, the cast gives funny, real, moving performances as these sometimes unlikable but always very human characters. Gloria is extremely timely and relevant, and will likely encourage many conversations walking out of the theater. 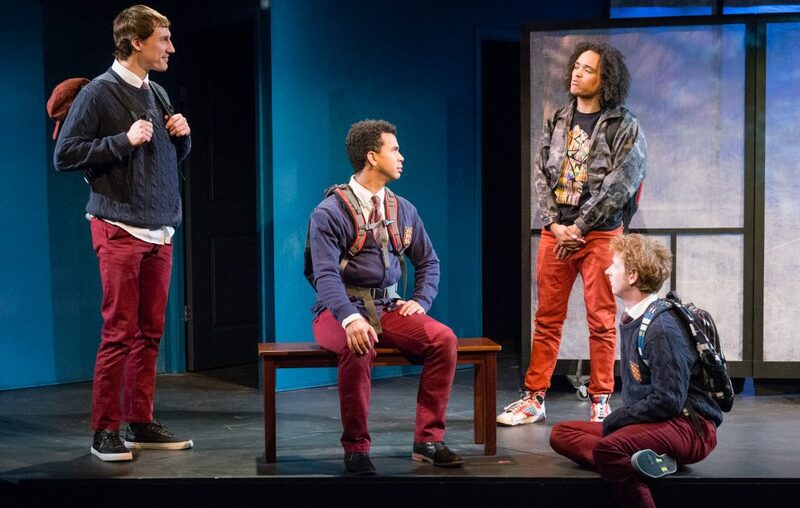 All of the plays share the same basic set - a backdrop with a few doors - that can transform from the recording studio of Hype Man, to the school, home, and jail cell of Hooded, to the office of Gloria with the addition of a few set pieces. The fun part of seeing plays in rep (and perhaps why it's rarely done) is that you get to see the same cast and creative team tackle multiple plays, characters, and stories, and see how the plays intersect and begin to tell a larger story together than they would individually. Here that story is told by the black male voice, a voice too long silenced that we need to hear right now, more than ever. And because Mixed Blood is the number one #TCTheater company when it comes to diversity, inclusion, and representation, I fully expect them to also feature work by women of color in a similar way in the not too distant future. 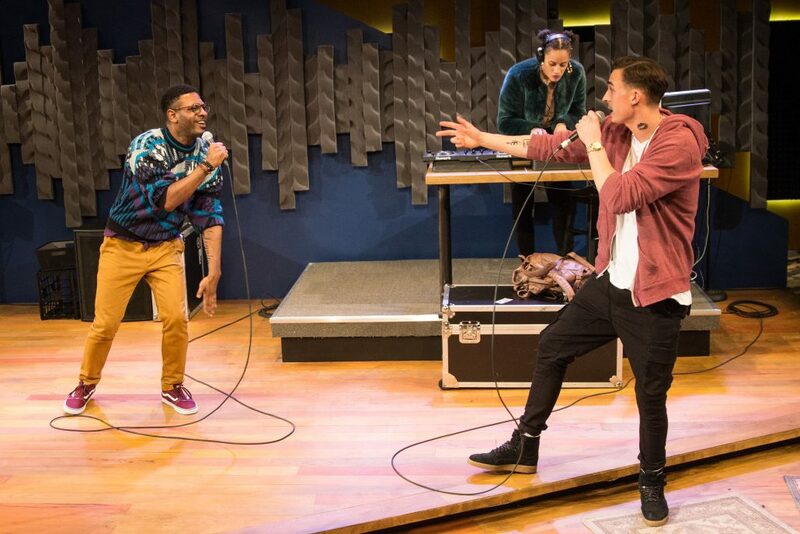 Hype Man, Hooded, and Gloria continue in rep at Mixed Blood Theatre in the West Bank neighborhood of Minneapolis through December 2. Go see them!